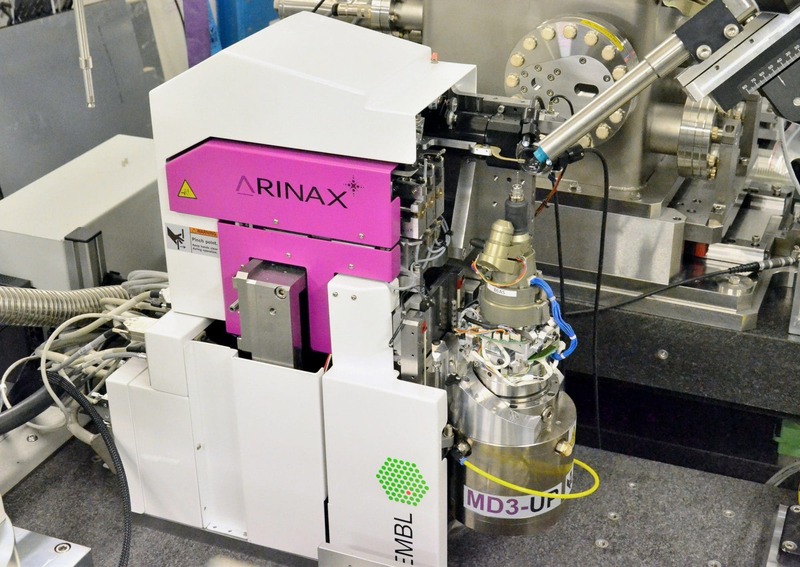 The MD3 diffractometer is dedicated to modern macromolecular X-ray crystallography on synchrotron beamlines. Thanks to its vertical Ω axis configuration and highly performing alignment axes, the MD3 achieves an exceptional sphere of confusion of 100 nm (radius, @100 deg/s) and a dynamic accuracy of ± 0,7 mdeg (@10 deg/s). 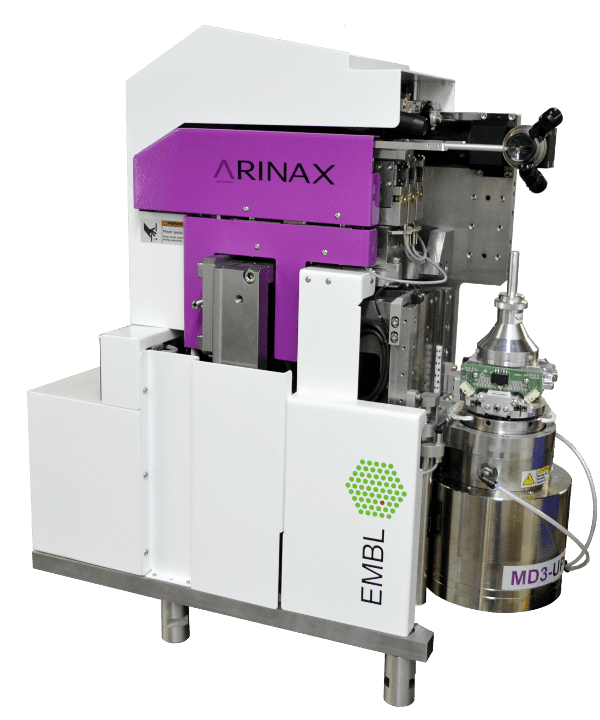 The MD3-UP is a co-development of the European Molecular Biology Laboratory (EMBL) and Arinax Scientific Instrumentation. With its 100 nm sphere of confusion (SOC) the MD3 sets new standards in MX crystallography at synchrotron based beamlines. 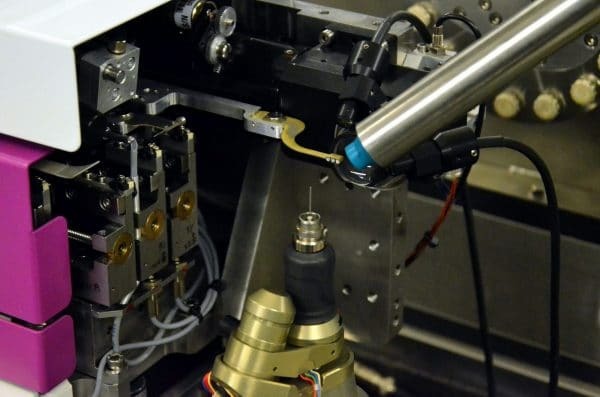 The extraordinarily small SOC at high rotational speed is not only valid for the Ω-axis as a sole mechanical set-up but for the entire pile of mechanical axes: an xyz-alignment table supporting the Ω-axis and an additional xy-sample centering stage on top of the Ω-axis. The MD3 Ω-axis features a superior accuracy perfectly suitable for advanced data collection strategies like helical & grid scans. The Ω-axis combines a static precision of ±0.5 mdeg and an exceptional dynamic precision of ±0.7 mdeg (@10 deg/s rotational speed, with a mounted SmartMagnet-goniometer head). Due to the vertical Ω-axis geometry gravitational effects does not affect the SOC. Even when using a kappa-goniometer head the SOC remains exceptionally small. The MD3 diffractometer is available in two orientations, the MD3-DOWN and the MD3-UP, with an Ω-axis pointing either downward or upward. The MD3-DOWN is ideally suited for experimental configurations with 6-axes sample changer robots using vials with SPINE sample pins. The MD3-UP has the advantage of free space above the sample, giving easy access to the sample position. The MD3 integrates the On-Axis Video microscope (OAV) for precise sample and beam spot visualization. The OAV allows to perfectly align the sample with respect to the center of rotation and the X-ray beam. This patented video microscope is controlled within the MD3 software and combines high image quality with parallax free imaging and advanced software functionalities like the “3 click sample centering”. The MD3 integrates multi-adjustable tools which can be moved into or out of the beam. These tools are positioned along the beam path before and after the sample, e.g. the beamstop in the latter case. These different tools are the beam shaping apertures, a background reducing capillary, a scintillator-photodiode pin for beam characterization and a movable beamstop with variable beamstop-to-sample distance. All these integrated tools are fully controllable within the MD3 software which assists and supports the user with features like the beam location or sample alignment & centering. The Ω-axis is mounted on an alignment table with three linear and orthogonal axes, the so-called xyz-alignment table. Two linear tables, perpendicular to itself and the Ω-axis, are mounted on top of the Ω-axis. This is the so-called xy-centering stage. Finally, the sample holder or any other goniometer head, e.g. the Mini-Kappa MK3, is mounted onto the xy-centering stage. All of these different motorized axes can be moved simultaneously and are controllable in real-time. This is exactly what is necessary for 4D data collection strategies. Combined with high accuracy and dynamic precision for all of these motion elements the MD3 becomes the ideal high precision goniometer for modern MX-diffraction techniques like helical scans, grid scans and serial crystallography. These advanced control features and scan-types are integrated and fully supported by the MD3 control software. A helical scan consists in an oscillatory movement with the Ω-axis while scanning the sample with a series of linear movements. These combined movements result in a helical sample trajectory. The aim is to entirely scan the crystal with a limited impact due to radiation damage. This method is especially adapted to elongated or needle like crystals, (Gabadinho, 2010), (Flot, 2010). The grid scan method consists in scanning a crystal according to a virtual grid: each cell of the grid has a dimension close to the x-ray beam size. Each cell is irradiated with a sufficiently low x-ray dose and diffraction images are recorded. Then, the diffraction power is mapped for the entire grid. The main application is to find the area of a crystal which is best suited for data collection. The diffraction power map allows selecting the best diffracting crystal area. Serial synchrotron crystallography is a method that combines the advantages of grid and helical scans: thousands of small sized crystals (0.2 to 5 µm) randomly distributed on a single sample support are scanned in only one operation. Then, the collected diffraction data from all of these crystals is merged in a single data set (Gati, 2014). Serial synchrotron crystallography is a very powerful diffraction technique which overcomes the difficulties of x-ray data collection from micro-crystals. Having specific questions about MD3 and Serial Crystallography? Recent X-ray detectors integrate several trigger modes for synchronization with the MX goniometer. The MD3 is compatible with the classical single trigger mode, but it is also fully-compatible with the multi-enable mode. The MD3 provides continuously the exact position/orientation to the detector: consequently, each diffraction image is tagged with the crystal’s position and orientation. This functionality is available for all crystallography methods, including advanced data collection strategies. The MiniKappa, MK3, is an easy to mount/dismount goniometer head which offers an additional kappa and phi axis. This gives numerous possibilities of crystal re-orientation in a fast and easy way. Together with the software package STAC the MK3 allows setting up crystal alignment strategies which lead to more efficient x-ray data collection (Brockhauser, 2013). An optional goniometer head, the Plate Manipulator, for the reception of 96-well plates enables in situ experiments to be done with the MD3. This goniometer head is fast and easy to mount/dismount. It is equipped with an extra motorized axis. Mounted onto the MD3 Ω-axis, any crystal, even small sized, can be reached with high accuracy in any of the 96 wells, e.g. for in situ screening. 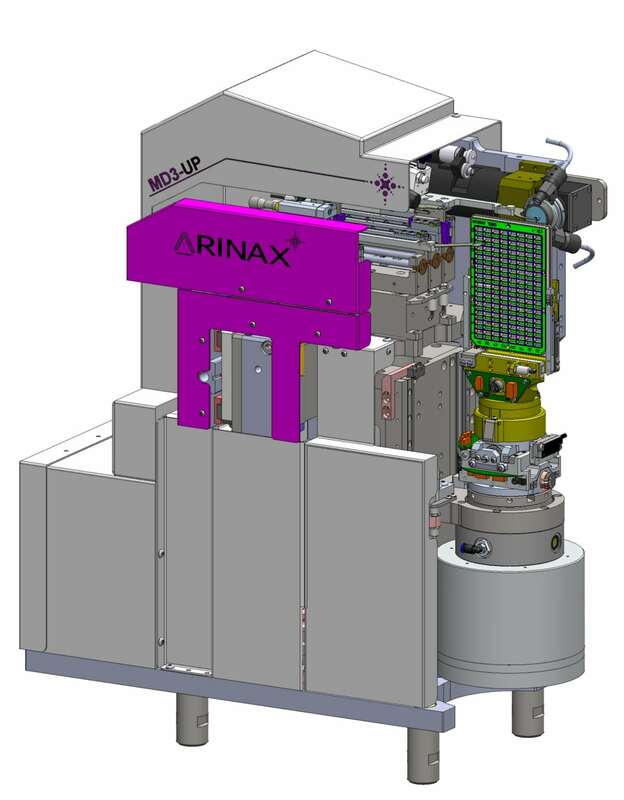 For over 12 years now Arinax has developed strong competences in beamline integration. 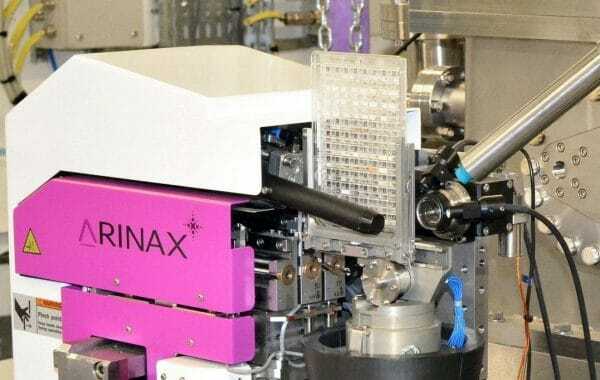 Thanks to this strong expertise, Arinax can entirely integrate the MD3 to beamline specific software like MXCube or Blu-Ice. To do so, the MD3 software is fitted for multi-device servers: TINE, TANGO and EPICS. 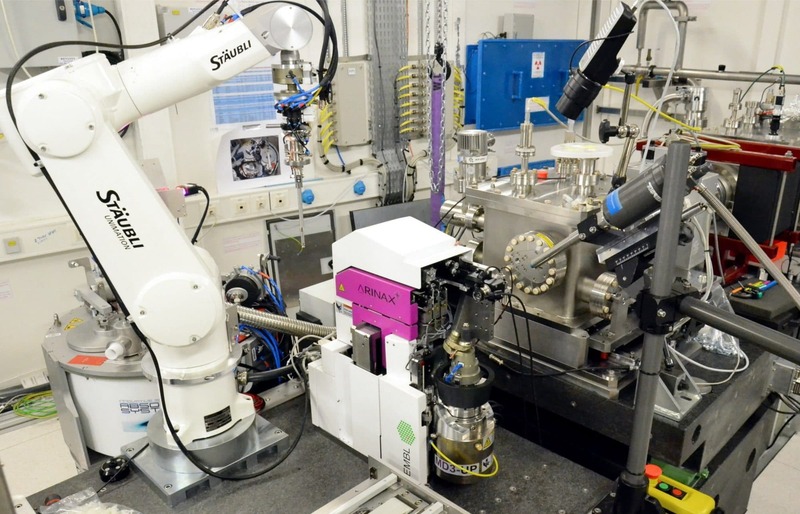 In addition, the MD3 is fully configurable for automated beamlines using sample changer robots, like the ones distributed by IRELEC-ALCEN. C. Gati, G. Bourenkov et al. (2014), « Serial crystallography on in vivo grown microcrystals using synchrotron radiation », IUCrJ Vol. 1, part 2, Pages 87-94. Brockhauser. (2013). The use of a mini-kappa goniometer head in macromolecular crystallography diffraction experiments. Acta Cryst. D69, pp. 1241-1251. Flot, D. (2010). The ID23-2 structural biology microfocus beamline at the ESRF. Journal Synchrotron Radiat., 17(Pt 1): 107–118. Gabadinho, J. (2010). MxCube: a synchrotron beamline control environment customized for macromolecular crystallography experiments. Journal Synchrotron Radiation, 17(Pt 5): 700-707. Song, J. (2007). Diffraction-based automated crystal centering. Journal Synchrotron Radiation, (Pt2): 191-5. Stepanov, S. (2011). Fast fluorescence techniques for crystallography beamlines. Journal Application Crystallography, 44 (Pt4): 772-778. For more information about capillary, beamstop, motor reference, … See our download webpage. Having a specific request? e-mail us!